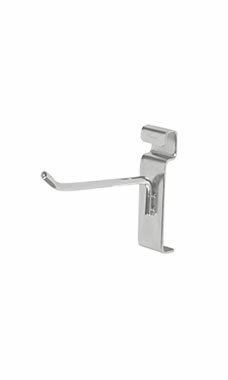 The Chrome 4" Peg Hook for Wire Grid will let you maximize your wire grid panels and free standing displays. Merchandise hangs neatly and uniformly. The flexibility of the fixture allows for displaying all types of accessories and small housewares. Additional features include 6 mm diameter tubing with an upturn at the tip to discourage product from falling off. An integrated mounting bracket allows for easy installation and stability.